Just what constitutes the Equinox And What Is The Equilux? Ancient Archeological Evidence Fools Contemporary Religious Wisdom – A Portable Equinox Sunplot Dial From Ancient Egypt / Greece. This paper reveals the simple ancient methodology by which the astronomical equinoxes and the solstices can be both directly and practically observed by the naked eye, to precisely the very day on which they occur, no matter where one is residing on the globe(i.e. at whatever one’s latitude north or south of the equator), excluding the direct North and South poles. According to Rabbinic’s and Karaites, the equinox is defined as the time of equal day and equal night hours and that cannot be objectively “observed”. Furthermore they argue that the ancient Israelites had no ability or technical knowledge to be able to accurately identify the day of the equinox. In addition they argue the equinox has only been identifiable through modern astronomy science. Consequently they argue that the equinox therefore cannot be used as the accurate anchors of the biblical calendar. The commentary is worth a read to understand how Judah has mystified the significance of the equinox as a significant pinpoint measure of the biblical calendar of Moses. Interestingly, some Messianic sites, in their wisdom, similarly proclaim that the equinox was simply too complex for the ancients to be able to precisely identify and observe the day of the equinox and that understanding the word “tekufa” as referring to the equinox and the astronomical sun is an anachronism – see http://www.sightedmoon.com/?page_id=125 . So just what constitutes the Equinox And What Is The Equilux? Firstly we need to understand that the astronomical equinox does not necessarily equate to the common use of the definition of the equinox being the equality of daylight and night hours. We need to understand that there is a difference between what is defined as the equinox as an accurate astronomical position of the sun, as opposed to the “equilux”. When the term equinox is used to indicate the period of equal day and night hours it is by broad association of the definition, but unless one is living on the equator, it is not the astronomical point of the equinox as determined by the precise position of the sun as it marks a change of the seasons. The difficulty with the “equilux” is that it is a virtual impossibility to identify a day of the equilux occurring across the globe since its measurement is highly influenced by one’s latitude position in relation to the equator on the globe, and the refraction of light by the earth’s sphere and atmospheric conditions. These two factors combine to mean that the Sun will appear to have “risen” when the centre of the disk is still 50 arcminutes (16 + 34) below the horizon, making the amount of daylight longer than the expected 12 hours. How much longer depends on where on Earth you are, but in the UK the length of the day is approx. 12 hours 10 minutes, rather than exactly 12 hours. Thus when Judah’s mystics define the equinox in their broad terms of the equal day / night hours – which by scientific quality is properly termed the “equilux” – which is relative according to one’s latitude across the globe, then they are indeed correct in saying this point is not readily measurable and identifiable as one specific day or point in time across the globe. This is because the measurement of the equilux is highly dependant on one’s position (latitude) on the globe. However, in contrast to the “equilux”, the actual physical earth day of the astronomical equinox can indeed be readily identified, regardless of the latitude one is positioned at across the globe. The fact that it is so readily identifiable identify reveals that the contemporary argument that it was an impossiblity for the ancient Israelites to have had the knowledge or technology to be able to make this identification, (and thus they argue it is to be regarded as an anachronism in regard to the theology of the biblical calendar), rather indicates the complete arrogance and ignorance of modern scholars of religion, rather than the historical ignorance of the ancients. This is just another indication of the complete opblivion of the ancient memory in regard to the “ancuient paths” of biblical truth! Indeed, the Hebrew word “Tekufa” – referring to the “circuit of the sun” is accurately pointing to a definition of a precise astronomical point in time where the sun in its solar circuit is positioned in relation to crossing the earths’ equator, or in real physics it marks the point at which the earth in its orbit around the sun changes from one agricualrutal season of winter to spring and summer to autumn, rather than the definitions the religious would have many believe as meaning a time of equal day and night hours. (Which by the way is the precise meaning of the Roman term “equinox”). So it is interesting that the religious employ a traditionally Roman definition of the term rather than a biblical or physical truth definition for the astronomical point of the sun crossing the equator, marking the physical changes in the seasons. Furthermore, as mentioned previously, messiniac Karaites argue that the word “Tekufa” (meaning the “circuit of the sun”” in supposedly rather refering to equal day and equal night as an anachronism, completely ignorance of ancient archeological instrumanets that can be held in the hand and which the ancients readily identified the equinoxes so that they would be abel to plant and reap on time. Arguing that the ancients never had any such abilities to understand the precise astronomical “circuit” of the sun, also demontsrates just how ignornat modern religion has become of the study of astronomy today. 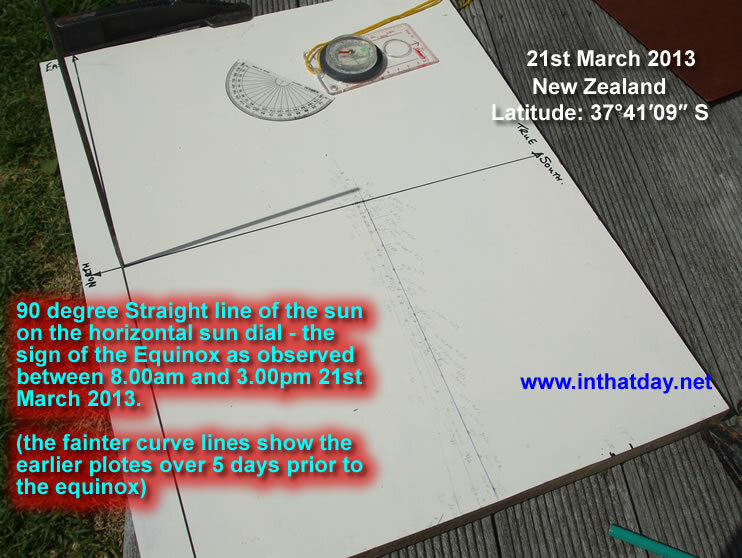 Below it is practically demonstrated below just how simple a feat it is to accurately identify the precise day of the equinox (as opposed to the equilux) regardless of whatever latitude one is located at across the globe. The larger the sundial, the easier it becomes to accurately identify the straight line occurrence of the equinox, as one must look to the outer edges (first sunrise plot and sunset plots) s to see a complete straight line has indeed ocurred. 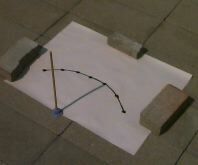 My own horizontal sundial is constructed using a large piece of of white shelving board. I am in the southern hemisphere so the sun passes in our northern side of our sky sky. In the northern hemisphere, the sky would be passing in the southern part of the sky, and at the equator the sun would be passing dead overhead. The sundial must be accurately aligned at your position to true north, south, east and west. (do not use magnetic north of a magnetic compass). 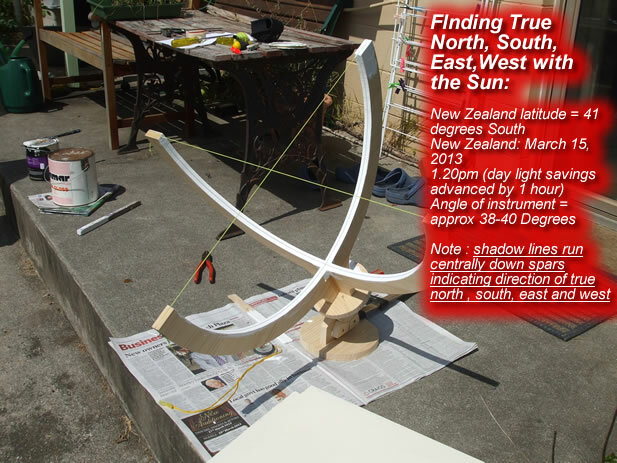 To identify truth north and south by the sun I built the following instrument and when it is aligned to the sun such that the shadow lines of the strings falls precisely in the middle of both axes, the true north , South, east and west have been identified. This then enable me to accurately align my horizontal sundial accordingly. Depending on your position on the earth, you will experience the equinox shadow line occurring either above the straight east west line on your sundial (northern hemisphere) or right across your east west line on you sundial (at the equator) or below your sundial east west line in the southern hemisphere , but the curved lines that occur as the sun moves to the winter and summer solstices will always have the same curved shape – only the position of the actual equinox line plot will occur above or below your sundial’s east west reference line depending on you position in the northern or southern hemispheres, but the curves that occur in relation to that actual equinox line that occur on your sundial as the sun moves to either the solstices will always be the same shapes being experienced across the globe just as we all experience the straight line. Thus to observationally identify the precise day of the equinox, one simply needs to plot the shadow curve of the sun on the hour over a few days before the expected equinox event, and when a straight line appears across the east -west sides of the sundial, the very day is identified. When the horizontal sundial is positioned correctly (pointing geographical north and not magnetic north) the shadow plot of the day of the equinox presents itself as a perfect straight line as opposed to a curve, regardless of one’s latitude on the globe. Look especially at the outer edge of the sundial (dawn and suk readings) to ensure you have the straight line – any slight curvature there means that you either 1) haven’t yet observed the equinox straight line occurring or 2) if the mean sun calculation as marked on our common calendars has indicated it should be occurring, then your sundial may not be accurately aligned to true north, south, east, west and is not given you an accurate reading. 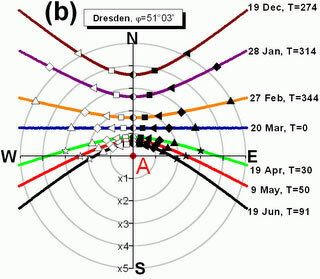 In the animated graphic below you can watch from the vantage of a range of latitude positions across the globe from the north pole to the south pole , how the shadow plot of the equinox (the straight pink line) as opposed to the winter solstice plot (the curve in blue) and the summer solstice plot (the curve in red) is occurring at different positions above or below the sundial’s east west refernce line, based on the persons latitude position across the globe. On the graphic the dark red spot marks the position of the vertical sundial stick and the curves are presented from various latitudes (see “lat” ) from the north pole through to the south pole. Now understanding just how simple it is to be able to identify the exact day of the equinox no matter where one is positioned across the globe, we can now understand how all the ancients peoples would even have had small portable sundials that they could carry, which accurately and precisely identified the equinox. If the Egyptians had this understanding, how is it that religion would have us believe that the ancient Israelites would have been too ignorant or incapable to be able to precisely observe and identify this phenomenal astronomical event? We need to remember also that awareness of the equinox was also matter of a nations’ very survival and economic well being since it gave precise indications of the agricultural calendar and the changes in the seasons and the times for preparing for sowing and reaping. Such is the nature of the prison houses of men’s science and religions as opposed to creation truth! The Equinox and The beginning of The Biblical New Year. When a straight line is identified on a day around the 19th to 21st March, then creation is heralding to us that the beginning of the new biblical year has arrived. When the straight line appears on a day around the 21st to 22nd September, creation is heralding to us that Month 7 of the biblical calendar has arrived. Even if a polar shift should occur, the identification of the straight lines will herald the beginning of the 1st and 7th months. From there the counting of days as per Leviticus 23 identifies the specific appointed times. In prophetic time, the “wilderness place” now approaches us. What if one has no access to computers, and one is faced with the wilderness place with no communication with others, and one needs to identify and keep the biblical calendar’s appointed times – how will one be able to identify the beginning of the year from the new moon, when which new moon defines the beginning of the biblical year or whether there is an intercalated 13th month? No – creation gives us its own independent and reliable testimony of when the 1st day of the biblical year can be known. It also testifies when the 1st day of the 7th month can also be known. Using a very simple methodology one can practially observe and precisely identify the exact day of the Vernal and Autumnal equinoxes with one’s own eyes! Religious theologians argue that using the equinox is not acceptable and must be ignored, because 1) the ancient peoples simply didn’t have the ability or technology to do this and 2) because they claim that the days of the equinoxes are not practically observable for reasons that they confusingly define the equinox as the equilux… however creation around us – the heavens and the earth – the plants, the birds and the weather – testify quite a different message for those who have some wisdom and understanding to be able to watch and observe! YHVH states the heavens declare the glory of YHVH and the whole of creation on the earth below knows this, demonstrates this and responds to the perfect points of the “circuit of the sun” (the “tekufa”) in its equinoxes which mark the precise turning of the seasons. As these points precisely indicate the exact beginning of the 1st month and the beginning of the 7th month of the astronomical year on the earth, what then is creation perpetually witnessing to us concerning the wisdom and the exegetical religious gymnastics of men? Creation seems to be telling us that when men are motivated to re-define the biblical calendar which is intimately linked to creation, however sincerely they may describe their attempt, the result is but to impose a dark age. John 12:35 Then Yahushua said unto them, Yet a little while is the light with you. Walk while ye have the light, lest darkness come upon you: for he that walketh in darkness knoweth not whither he goeth.